Google Maps is one of the best navigation modes available to a user, regardless of the OS they use. However, the entire idea of maps is that they are 2-dimensional. Well, it seems like Google disagrees, and has started visualizing a map as a 3D object. Okay, not the entire map, but something at least. If you were bored and thought of continuously zooming out from the Google Maps, you’d finally reach a flat map of the surface of the earth. However, now you won’t, because Google is all set to go 3D. 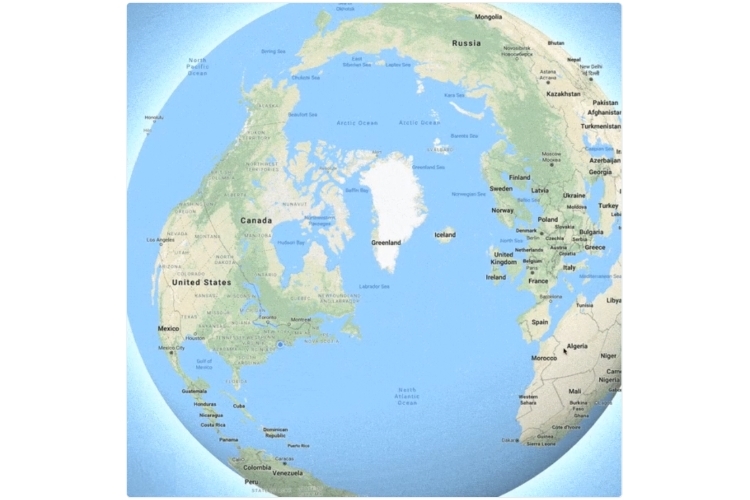 As announced in an official tweet, Google Maps now shows the Earth as a globe instead of a flat “Mercator” projection as before. While you won’t notice the change when you first open the app, you can get a moon’s-eye view of our world if you zoom out far enough. Or as described in Google’s own words, “Greenland’s projection is no longer the size of Africa”. To make things clear, Google is referring to the fact that it’s impossible to represent the true area of different regions on the planet using flat projections or in 2-dimension. Mercator projections, which are the most commonly used means of projections, enlarges regions that are farther from the equator despite showing the correct shape of countries. As a result, a few countries look way bigger than they should. For instance, Greenland looks the size of Africa, when it’s much, much smaller. Thankfully, with the new Globe Mode, this should now be fixed. The newly announced “Globe Mode” update is only available on desktop and not mobile. However, since it relies on WebGL, the feature works on all major browsers, including Chrome, Edge, and Firefox.